Kids love fruit and eat a lot of it, so they like to learn fruit in Spanish. Here are some of our favorite Spanish fruit activities to do with language learners. 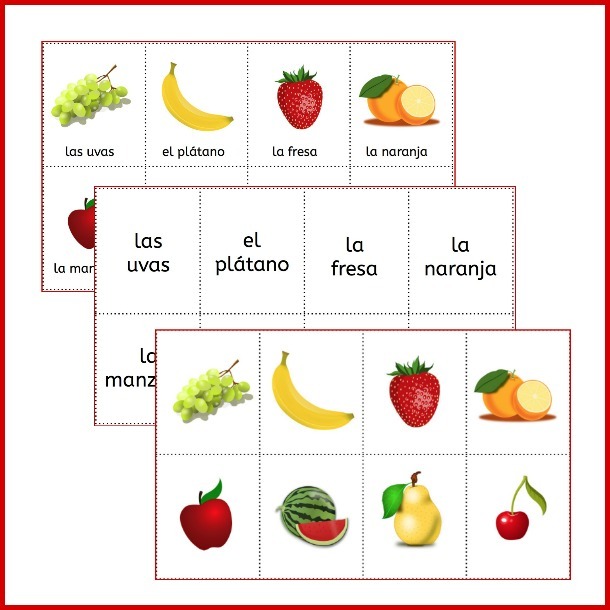 When kids learn fruit in Spanish they also learn vocabulary for colors and sizes. In addition, talking about fruit is an opportunity to reinforce healthy eating habits. In this easy Spanish conversation the speakers check the ingredients for a fruit salad. It makes an excellent introduction to tasting fruit or making a fruit salad in class. Las frutas del mercado is one of our favorite videos for novice learners for several reasons. First, it focuses on the verb hay and fruit vocabulary. Next, it has a strong cultural component with images of a Mexican market, fruit with chile and lime, and fruit ice cream flavors like limón and mango. Finally, the second-half of the video is interactive, asking kids to call out the names of fruit. 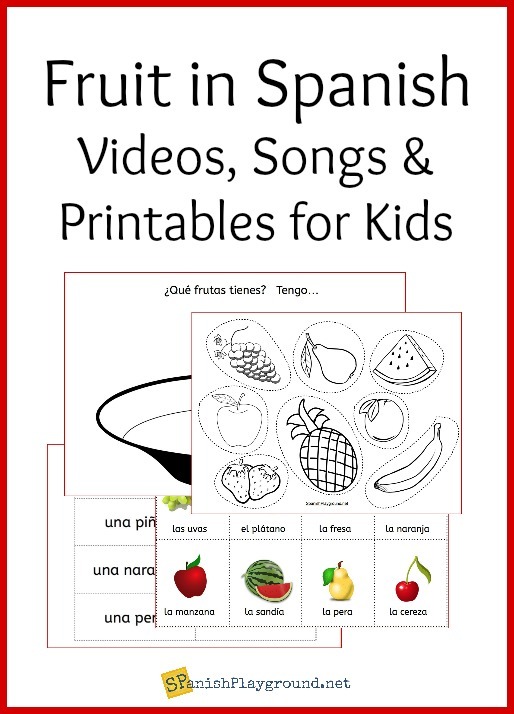 In addition, you can find a free printable flip book and picture cards for the video here: Spanish Words Kids Love: Las Frutas. This fun Habla Pamela video focuses on one fruit, las manzanas. It is great comprehensible input! Singing is a fun way to learn fruit words, and there are lots of fun Spanish fruit songs. Many incorporate color words, too. So, check out our YouTube playlist of fruit in Spanish songs and videos to listen to some of our favorites. In this activity, kids color and cut out fruit to fill their fruit bowl. Then, they answer the question ¿Qué frutas tienes? using tengo and words for fruit in Spanish. The activity includes the bowl, the fruit to color and cut out, and labels if you want to have kids add the words to the page. For example, they can put the text around the edge and draw a line to the fruit in the bowl. Get the printable Spanish Fruit Bowl Cut and Paste. This memory game has 3 sets of cards. There are picture cards with text, picture cards without text and word cards. So, you can print two of the same set to play memory, or you can match prints sets to picture to word. 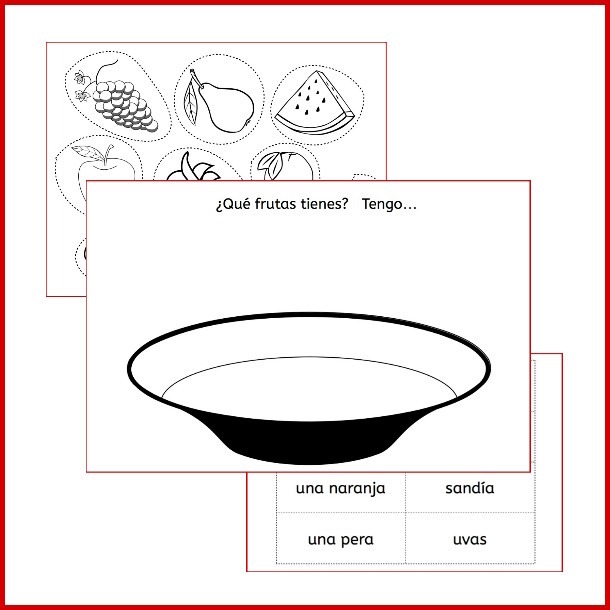 Get the printable Fruit in Spanish Memory Game. You can also talk about fruit in connection with plants using this printable page. There is a label-the-parts of the apple printable page and also a syllable count with words related to apples. Check out the Apple Activities in Spanish. In addition to picture cards, you can use fruit counters and toy fruit for language activities. Or, if your group is small enough you can use real fruit to do guessing games, descriptions and pattern activities. I try to keep in mind that fruit has many cultural connections. Students may not be familiar fruits that are very common in Spanish-speaking countries, such as mango and papaya. They also may not be aware that in Mexico, for example, fruit is eaten with lime and chile. Class can be a great place to taste new fruits and learn more about how they are used in Latin America. Try making aguas frescas of a favorite fruit, or try some Tajín and lime to give kids a taste of Mexico. Fruit in Spanish is a great way to connect to other cultures.